CloudCall is a dynamic, cloud-based business communications solution with powerful integrations with CRM systems. With it, you can achieve higher rates of productivity and more visibility into your customer support. This connectivity also allows you to save time when it comes to collecting data during calls and using them for follow-ups. CloudCall is also a flexible application that can adapt to your industry’s unique requirements. On top of that, it is able to meet the different needs of your business units to ensure that they are able to perform their CRM and communications tasks seamlessly and efficiently. Moreover, CloudCall provides you with tools that let you and your team give your customers the best support. The application has a variety of collaboration features that direct callers to the appropriate department who can provide them applicable assistance. 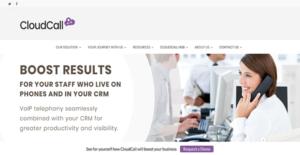 CloudCall is a business phone system that seamlessly interfaces with your CRM application. Because of it, you can contact your customers and your partners directly from your CRM window. Other than that, this integration provides you with a clear and full overview of call activities, including call records. With these capabilities, you can assess your employees’ performances and make certain callers are receiving the assistance they need. With CloudCall, you can create call groups based on their skills. This way, employees can easily route callers to the right unit who are better equipped to answer their queries. This saves your teams time in finding people who can properly resolve customers’ issues. This enables every team to take more calls as well. To ensure the high quality of support, CloudCall provides supervisors with the means to oversee call-related activities on the floor. The administrative dashboard shows them the number of successful calls, drop rates, average call times, and more. By having access to such information, you empower your supervisors and managers to manage their teams efficiently. You can make certain that you never leave a crucial detail out of the message you leave in a recipient’s voicemail box with CloudCall. That is because the business communications platform allows you to pre-record up to five messages so you can automatically leave a well-composed but informative voicemail. If you are interested in CloudCall it could also be sensible to examine other subcategories of Best Business Phone Systems gathered in our base of B2B software reviews. There are popular and widely used systems in each software category. But are they essentially the best fit for your company’s special needs? A trendy software product may have thousands of customers, but does it offer what you require? For this reason, do not blindly shell out for popular systems. Read at least a few CloudCall reviews and think about the aspects that you wish to have in the software such as the fees, main features, available integrations etc. Then, shortlist a few systems that fit your requirements. Try out the free trials of these apps, read online comments, get clarifications from the seller, and do your research thoroughly. This profound groundwork is certain to assist you select the most excellent software platform for your company’s unique requirements. How Much Does CloudCall Cost? CloudCall has three types of enterprise pricing: 2,000 Minutes, Pay As You Go, and Unlimited. Each one has three options: Essential, Professional, and Performance. The prices may vary across the packages though their inclusions remain the same. We realize that when you make a decision to buy Business Phone Systems it’s important not only to see how experts evaluate it in their reviews, but also to find out if the real people and companies that buy it are actually satisfied with the product. That’s why we’ve created our behavior-based Customer Satisfaction Algorithm™ that gathers customer reviews, comments and CloudCall reviews across a wide range of social media sites. The data is then presented in an easy to digest form showing how many people had positive and negative experience with CloudCall. With that information at hand you should be equipped to make an informed buying decision that you won’t regret. What are CloudCall pricing details? What integrations are available for CloudCall? For a comprehensive list of integrations, visit the website or request information from the support team. If you need more information about CloudCall or you simply have a question let us know what you need and we’ll forward your request directly to the vendor.